Surrounded by pirate legends, incredible submarine wildlife and the closest to a tropical climate you’re likely to find in the US, the Florida Keys are one of the Sunshine State’s top destinations. A stretch of coral archipelago swerving out towards the Caribbean, islands such as Key West and Key Largo have been popularised by names from Hemingway to Humphrey Bogart, who loved the palm-lined beaches and characterful streets. 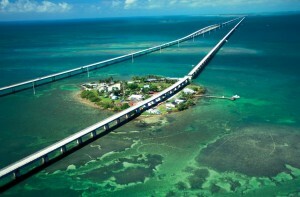 The Keys are linked to each other, and the mainland, via a route known as the Overseas Highway. Built over parts of the old East Coast railroad, the highway extends all the way from Florida City, over 42 bridges and 127 miles, to Key West, the most southerly point in the US. For many people this scenic drive is the only way to do the Keys and the route has been made infamous by the ‘Crocodile Crossing’ sign as you head for Key Largo, surely one of the most photographed signs in the world. Closest to the mainland, Key Largo is backed by the Everglades National Park to the north and the Atlantic to the east, where the snorkelling and deep-sea diving is superlative. Next in the chain, Islamorada is where to head if you’re keen to add a sailfish or a snook to your fisherman’s checklist. 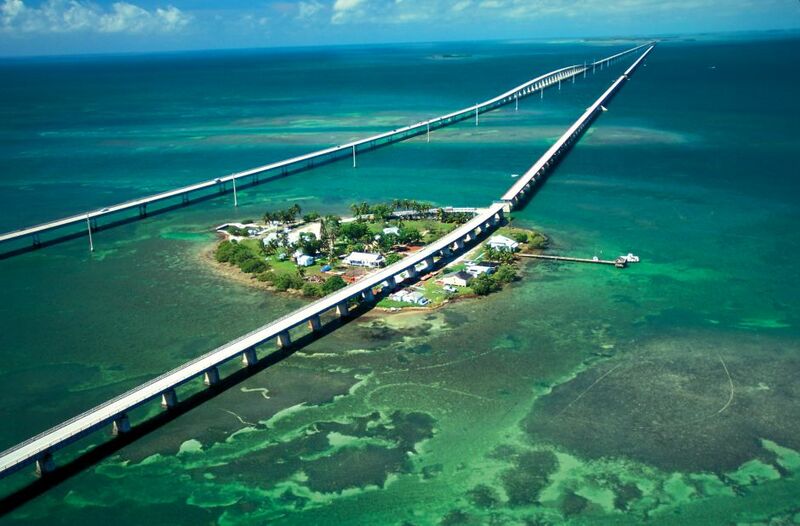 Add to this the fact that you can drive to the Upper Keys in around an hour from the state’s two international airports, and it’s no wonder cheap flights to Florida are proving so popular. The scenery only improves as you travel on towards the Middle Keys, where cities like Marathon span seven separate islands and the attractions come thick and fast. Stop at sleepy marinas in Duck Key, marvel at the miles of sandy shore at Bahia Honda State Park or check out the many rare species which call Big Pine Key home; you can spot anything from a hawksbill turtle to a tiny Key deer. Key West is where the journey ends but it’s this eccentric island which has become a favourite over the years, with its mouthwatering Conch cuisine and those famous tin roofs contrasting the colonial dwellings and the grand Hemingway home. Travel off-shore, and you’ll be rewarded by both a nature and history lesson at Dry Tortugas National Park, set in a floating Civil War relic and former prison, Jefferson Fort. In short, there’s a good deal to pack into a trip across these distinctive but kindred-spirited islands. Though it’s generally simplest to take the Overseas highway, there are plenty of chances to island-hop by ferry, and with Marathon and Key West hosting their own airports, you can even fly straight in. Whether you spend your time coasting over land, snorkelling below the water or just enjoying the uninterrupted views out west, the Florida Keys succeed in living up to all expectations.